Opening covers and rotated hose. 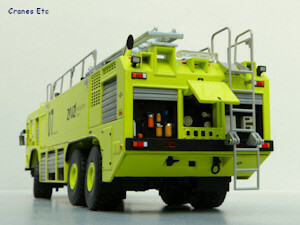 The Oshkosh Striker is an airport rescue and fire fighting (ARFF)emergency vehicle. 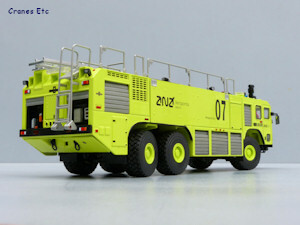 It is equipped with fire suppression equipment. 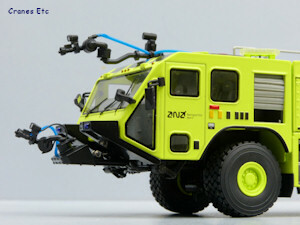 The version modelled here is a 6x6 chassis vehicle. It is in the colours of Aeroportas Algarve which is an airport operated by ANA, a concession partly owned by the French VINCI Group. 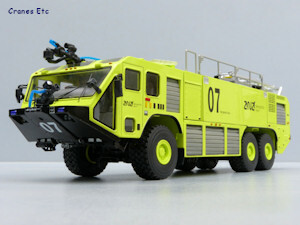 The model was delivered in a cardboard outer shipping container enclosing an Oshkosh box. Inside it is contained within a pair of expanded polystyrene trays. There were no missing parts or defects on the review model. One brochure is supplied. This is a reprint of an Oshkosh Striker marketing brochure, but actually there is more technical information printed on one side of the box. 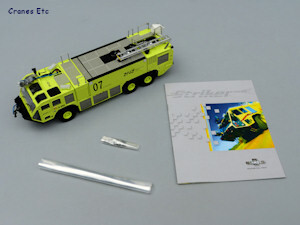 A plastic pointer is also included in the box, but there are no assembly instructions for the few parts that have to be fitted. 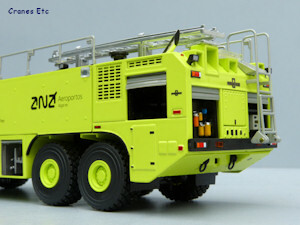 The Striker 3000 has a 6x6 chassis and it is modelled in good detail with all the transmission present. 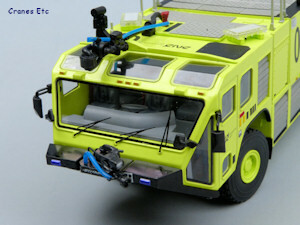 The axle assemblies have large fixing screws which gives a less realistic look. The metal wheels have large all-terrain tyres. The driving cab looks very authentic inside with Oshkosh on the headrests and the seat belts are modelled too. The instrument cluster has graphics applied. Outside there are thin wipers and metal mirrors. The roof glass has very fine graphics applied to give the impression of reinforced glass and it looks very good. 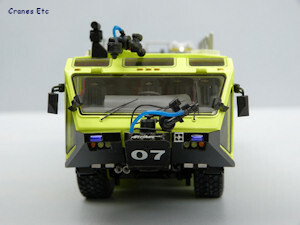 Two hose turrets are mounted at the front and these are detailed plastic parts with hoses running to them. The roof has etched metal grilles throughout with metal handrails. 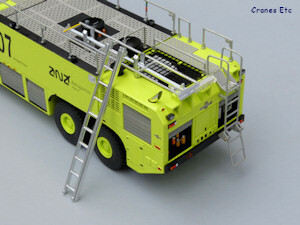 A ladder and other equipment adds to the detailed look. 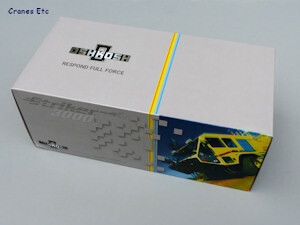 The sides are nicely finished with sharp graphics and detailing with paint highlights. There are a number of opening compartments and these contain various detailed elements which are high quality. Roller shutter doors are modelled in plastic and are a good modelling solution. 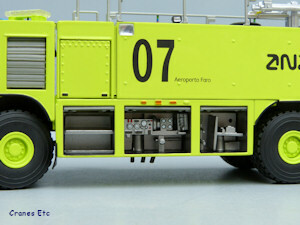 At the rear there is a metal access ladder and the permanently open rear compartments have painted detailing. Neat towing shackles are provided at a low level. 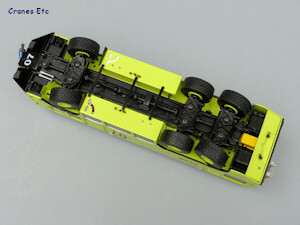 The front and rear axles steer but with a moderate range of movement. Each wheel has independent spring suspension. The two turrets rotate and can be angled up and down. The whole lower assembly can be lowered to achieve a low angle of attack for the spray. 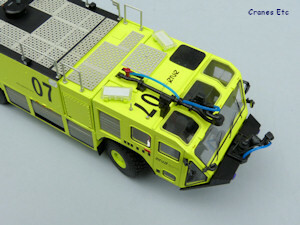 Access steps can be folded down or raised under the cab doors. Each side has five roller shutters which can be raised and lowered. From one opening a hose reel can be rotated out. There is also a hinged opening flap on each side. At the rear there is an opening flap that gives access to the engine. 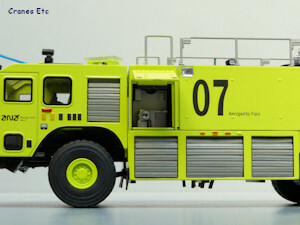 The rear access ladder folds down. The ladder on the roof can be removed and it is extendible. 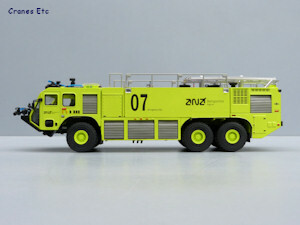 This is high quality model typical of the TWH Collectibles brand. The paint and graphics are excellent. It is good value for the quality offered. 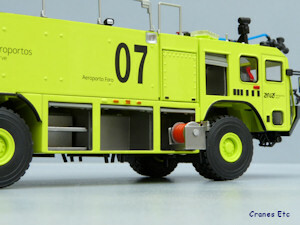 This is a very good quality model of an interesting airport emergency vehicle. In particular the functionality in terms of opening compartments is exceptional. It is an outstanding model at a good price. 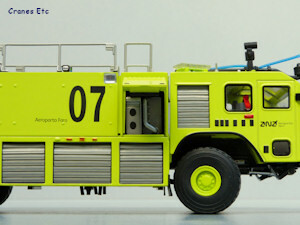 This model was produced in a number of different airport and owner liveries. 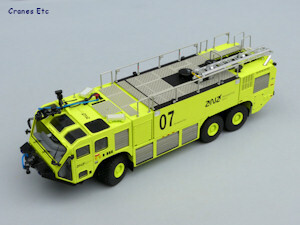 This version (078-01224) is one of four produced for the VINCI webshop in 2014 and was made in a limited run of 125 models. The parts out of the box. Front and rear steering shown at the maximum. Mesh grilles on the roof. Oshkosh printed on the seat headrests. Fine quality detailing on the cab. Removable roof ladder and lowered access ladder. Rear opening panel gives access to the engine.